Search engines have a big problem. There is so much data out there and it’s hard to work out what is what. Humans are great at inferring the context of web content, but this is much more difficult for Google, Bing, Yahoo!, etc.. These projects help you to surface your content more clearly or more prominently in search results. When your web pages include structured data markup, Google (and other search engines) can use that data to index your content better, present it more prominently in search results, and surface it in new experiences like voice answers, maps, and Google Now. While Google won’t come out and say that using Schema.org will definitely have a positive impact on your search rankings, they don’t deny it either (see their ambiguous answer here: https://www.youtube.com/watch?t=57&v=OolDzztYwtQ). But what they do say is that it’s likely to help your content to be presented more prominently, which is often as part of rich snippets (I’ll explain these below). 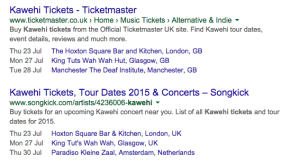 While using Schema.org markup may not improve your search rankings (yet!) it will help to give your content more prominence on search results pages. Is everyone using Schema.org markup? In my experience Schema.org markup is still underused. There are clear benefits, yet adoption seems to be slow. In fact a study by searchmetrics in 2014 found that only 0.03% of domains tested had Schema.org integration. THIS IS A GOOD THING! It means that you can easily get ahead of your competitors instead of always playing catch-up. If someone told you that there was a quick and easy way that many of you could improve your SERP CTR for minimal effort, you’d all stop in your tracks and give them full attention. Yet, Schema.org and rich snippets are still horribly under-utilized. See all of those stars? These are what’s known as “rich snippets”. That content is being pulled from Schema.org data. How do I know? Let’s have a look at the code. Can you see the itemtype="http://schema.org/Rating"? That’s the markup that has been added to give context to the content. The rating itself is defined by the meta tags below, also with Schema.org markup. 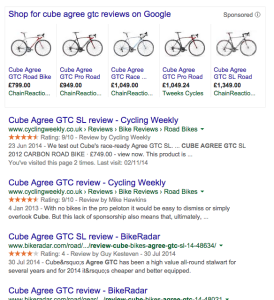 Let’s look at the BikeRadar code (the third search result) to see if they are using it too. Yep! There it is again. 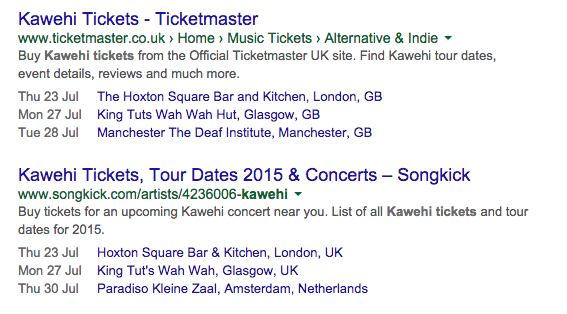 I don’t think there’s any coincidence that these two websites are at the top of the search rankings. Don’t get me wrong, there are other factors at play, but clearly Google is making use of this data to provide relevant search results. Google knows the date, and venue of the next three events near me. Again, these sites are using Schema.org markup. I bet some of you are thinking “none of those apply to my business”. You might be right, but there are other Schema.org ‘properties’ that you can use. Because Schema.org markup is so closely integrated with your site content and code, it’s not always an easy addition to your site. There seem to be some plugins that claim to help, https://wordpress.org/plugins/tags/schemaorg, but I don’t have any experience with those, and I’d question how exactly they can know where that data is within your theme code. Another option is themes with Schema.org baked in. These are most commonly directory style themes. Finally you could ask your developer to add some schema markup to your theme where you think it will be appropriate and useful. It actually doesn’t take long to add the appropriate markup, so shouldn’t be too costly, and it will avoid having to add yet another plugin. Let’s have a look at one of the most useful implementations of Schema.org markup – blog posts. If you visit https://schema.org/BlogPosting you’ll see a long list of potential properties to add. I’m going to focus on the basics here, you can always add more depending on your content. Next we’ll add some of the post meta data, starting with the published date. We could add more microdata here, like ‘pubdate’, but I’ve left that out for the sake of simplicity. We can also mark up the author information. Google has recently removed it’s ‘authorship’ rich snippets, but this data could still be used in the future. I’ve used a custom function to get the author avatar URL. The code is from this WordPress Development question. Does your site already use Schema.org? If you’re wondering if your theme already has Schema.org (or other structured data) this is a brilliant tool: https://developers.google.com/structured-data/testing-tool/. In my opinion structured data, including Schema.org is going to become more and more important. As the internet gets bigger search engines will have more content to sift through, and will have to deliver it in new ways. If your content is well structured, you’ll be at an advantage over your competition. If you have any questions about Schema.org markup I’d love to hear from you. Thanks for this post. I’m trying to get schema.org working for my blog and am meeting with a good amount of success — except I can’t make my featured image to show as itemprop=”image”. I think it’s because the HTML for that image is crafted in a separate function, but I don’t know. Might you have any advice? You can pass the extra keywords in the_post_thumbnail function (see the example above). I hope this is helpful. Let me know if you have any questions. Added hyphens(-) as the code is getting removed automatically. Thanks for the post! I have a couple of questions. Some of my blogs are using schema.org ready themes and pass the structured data testing tool with dozens of markup results and no apparent errors. I wonder if that’s enough though. The tags are rather “generic”, simply saying which is a headline and which is the content of a post. I wonder if that’s enough? If I have a blog where a post happens to include a review, shouldn’t I include the review tags as well? Which brings me to my next question, how can I markup the contents of a specific wordpress post? I wonder if using the “source” mode and manually adding the schema.org tags would work. I guess I’ll have to try it out. i want to use menu, sidebar and stielink search schema.. i’m not good at coding how to implement that in wordpress site ? i’m using wordpress seo plugin. but with that plugin menu and siderbar etc schema not coming..
Good info on Schema Markup. But if I would like to add a particular schema and some customized items to the post in WordPress manually, how do I do it. For example, my blog is about Windows errors and solutions, what type of schema and how do i apply it? Hi, great post and nice additional references. I was wondering which schema tag is more appropriate for blog content: text or description? I am using description on my site http://socialsubway.com. schema markup will boost the traffic… but is still difficult to enabling to different theme that have different code too..